Dolphin Awareness Month is a time to celebrate our cetacean friends while exploring how this intelligent animal species communicates, sleeps, locates prey, and much more. Learn how Georgia Aquarium cares for and studies this majestic species. 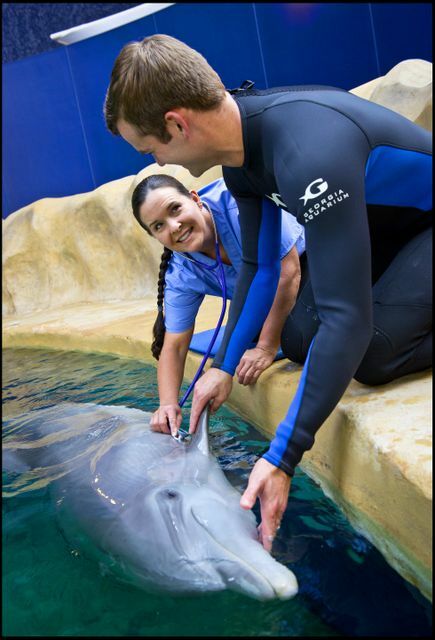 At Georgia Aquarium, we provide quality care for all of our animals. Performing medical assessments such as daily observations and data recording, routine weight monitoring and full physical examinations, our animals are cared for by well-trained animal experts and veterinarians. Partnering with the University of Georgia College of Veterinary Medicine, Georgia Aquarium’s Correll Center for Aquatic Animal Health is a state-of-the-art animal health and research facility. With top-tier equipment on site, our animal care team is able to diagnosis and treat animals accordingly, while also providing preventative medicine to avoid any potential illnesses. 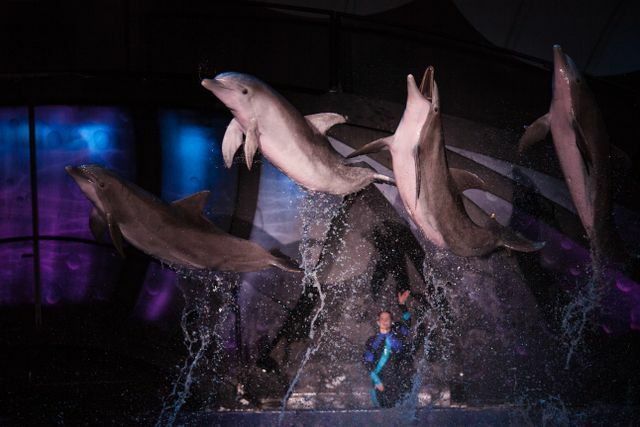 Striving to provide first-class animal care across the board, Georgia Aquarium’s sister facility, Marineland Dolphin Adventure in Marineland, Fla., embodies these same values. The oldest dolphin in human care, Nellie, was born on Feb. 27, 1953, and lived for 61 years. This is two times the average lifespan of dolphins in human care. 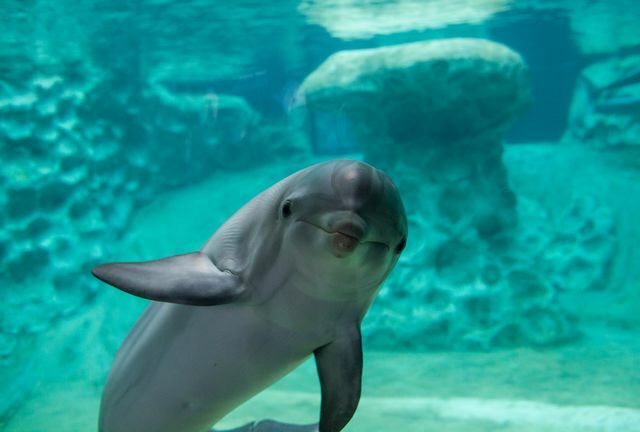 Dolphins belong to the cetacean family, which includes whales, dolphins, and porpoises. If you head to our AT&T Dolphin Tales exhibit, you will be able to see a member of the dolphin family, the common bottlenose dolphin. Bottlenose dolphins are primarily found throughout the Atlantic. They are commonly seen in bays, tidal creeks, inlets, marshes, rivers and along open ocean beaches. Most dolphins are seen in water depths of about 10 feet or less. These sociable creatures are primarily found in pods of two to 15 individuals. Diving with a duration of 20 to 40 seconds and swimming at speeds of about 3 to 7 mph, the bottlenose dolphin can show off its quickness and agility. Oily mucus is secreted to lubricate and wash away debris from the eye as dolphins swim. With their excellent hearing and vision, dolphins possess a hearing range that is larger than humans and can adapt to low-light conditions. Dolphins use their blowhole on the top of their head to breathe. It is no secret that dolphins are intelligent creatures, but they lack one sense that is known to be vital to many animals. Despite their incredible hearing and vision, a dolphin’s brain lacks an olfactory system, also known as a sense of smell. No sense of smell, no problem. Instead, dolphins use echolocation to locate prey, identify predators, and navigate in the dark or murky water. Echolocation stands as the primary sensory system. Dolphins use click-like pulses produced by nasal sacs in the trachea to create these high-frequency sounds. The bounce-back from these signals is received in the lower jaw bone and transmitted to the inner ear. This sends nerve impulses to the brain. Using echolocation, a dolphin can determine size, shape, structure, composition, speed, distance, and direction. Along with their heightened senses, dolphins communicate in a special, personalized way. Similar to the way humans communicate with each other, dolphins have a broad range of vocalizations, including whistles, grunts, trills, squeaks, and moans. Each dolphin has a signature whistle. Dolphins use this whistle to pinpoint each other’s location as well as to identify each other, even after being separated. These majestic creatures enter into a sleep state like humans and other animals. However, don’t let this ‘sleeping’ state fool you, dolphins are consciously aware of everything, even when they are asleep! The bottlenose dolphin engages in unihemispheric slow wave sleep (USWS). One-half of their brain is in a sleep state, while the other half maintains visual and auditory awareness of the environment while allowing them to surface to breathe. We must work together to understand and protect the various dolphin species located throughout our ocean and waterways. Georgia Aquarium researchers team up with several scientific partners to study and better understand the health of bottlenose dolphins. 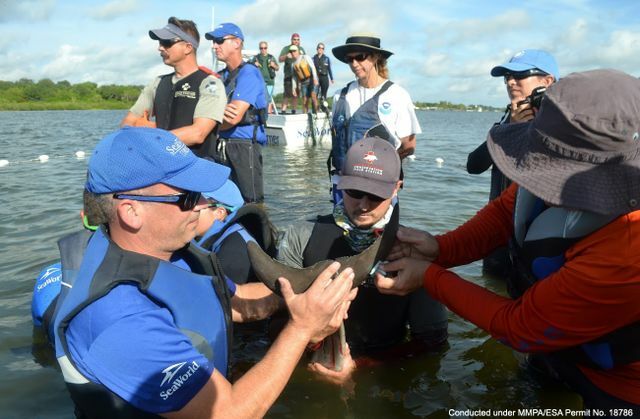 Operating in Florida’s most bio-diverse natural estuary, the Indian River Lagoon, dolphins have been assessed for the Health and Environmental Risk Assessment (HERA Program). 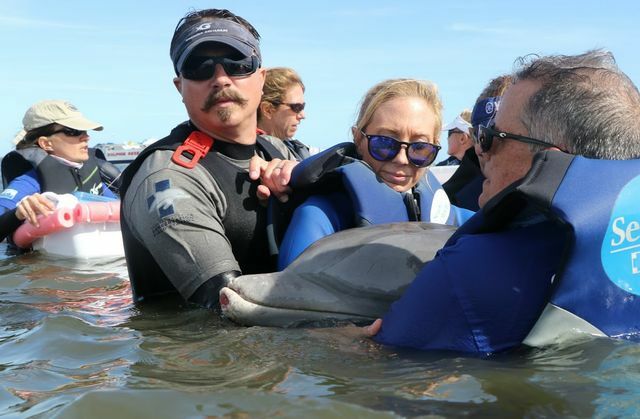 This program was implemented to evaluate potential environmental or human induced stressors that may be negatively affecting the health and long-term growth of bottlenose dolphin populations. 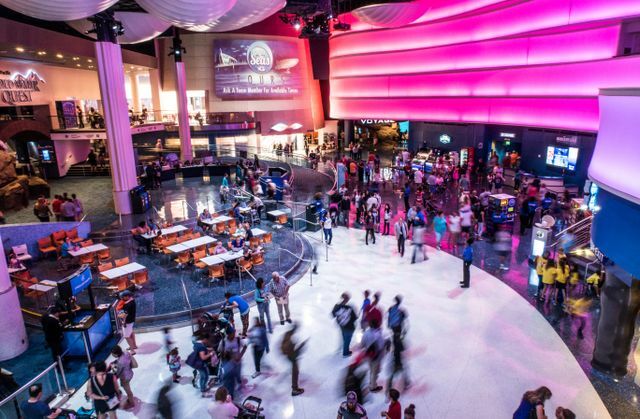 Next time you visit Georgia Aquarium, check out our AT&T Dolphin Celebration to witness the beauty, grace, athleticism, and intelligence of our bottlenose dolphins. 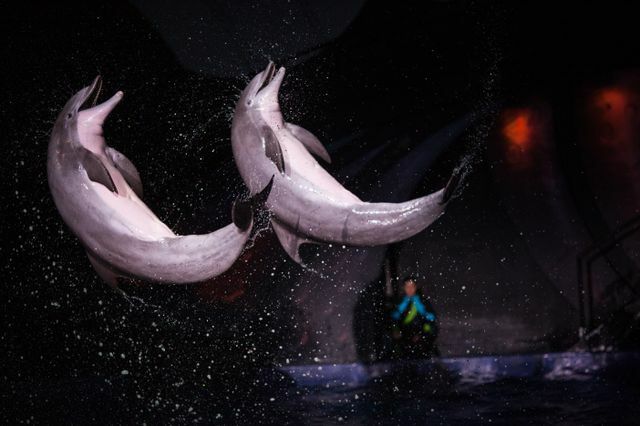 Also, participate in a dolphin encounter to receive a hands-on and educational experience with these amazing creatures. In honor of Dolphin Awareness Month, Georgia Aquarium is dedicating the month of March to our fantastically flippered friends. Each week during the month of March we will have a new story on dolphins, which will expand on their amazing characteristics. Check back in to our Newsroom and follow Georgia Aquarium on Facebook, Twitter, and Instagram to stay up-to-date using #DolphinAwarenessMonth.